For well-documented reasons the Greek political economy has received unprecedented attention in recent months, fuelled not least by the possibility of ‘Grexit’ and the potential impacts of this on both Greek society and the wider Eurozone. It is worth remembering that this treatment of Greece as a fundamental outlier – the main singular threat to the Eurozone – is relatively recent. Indeed, still subsequent to 2008, commentators were quick to caricature the divided and unequal state of Europe through the ‘PIGS’ and ‘GIPSI’ acronyms. Although these terms were already in use by economic and financial commentators, they gained their real traction following the economic collapse of Portugal, Italy, Greece and Spain (PIGS) in tandem with the global crisis. 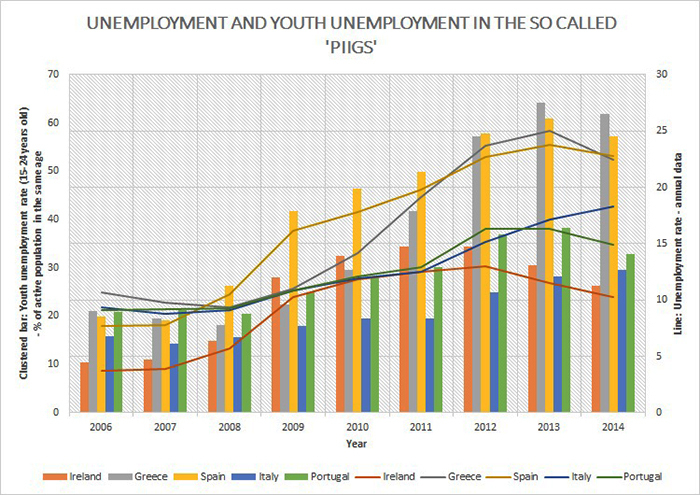 As the misery of the crisis continued to unfold, Ireland’s record budget deficit in 2010 made the case for adding an ‘I’ to the grouping and so the PIGS became either the PIIGS or the GIPSIs. It wasn’t nice, but the terms were widely used to the extent that market perceptions were also altered in the process. While it is now seemingly apparent that Greece genuinely does reside in a category of its own, my argument here urges the continued use of case-specific examination of states as the norm for political economy analysis. Yet, before developing this point further, let me at least acknowledge the existence of some common problems afflicting all of these states. Although unemployment in the EU as a whole surged after 2008, Greece in particular suffered a huge explosion of unemployment, which rose from a rate of 8.4% in 2007 to a high of 27.5% in 2013, according to Eurostat figures (2013). Similarly, but admittedly not as starkly, unemployment rates for the other so-called PIIGS also rose dramatically, increasing from 8.2% to nearly 26.1% in Spain (between 2007 and 2013). Portugal, Italy and Ireland also suffered (and continue to suffer) stubbornly high rates of unemployment in the double-figure bracket. Within this, the youth have been the worst affected in each case (see graph). It’s also fair to say a common medicine of austerity, heavily linked with neoliberalism, has been thrust upon the PIIGS and GIPSI states in question. Common prescriptions of welfare restrictions, the tightening of benefit eligibility and the privatisation of public resources were agreed everywhere in exchange for monetary assistance from the troika. Nevertheless, for all of these commonalities and despite the received wisdom, there are still good reasons why we should avoid too casual a bracketing of national political economies together (GIPSI states or otherwise). A useful entry-point into this discussion is to question the role of the EU in pushing countries towards particular reform routes. This goes immediately and directly to the heart of a recurring concern for many on the left: has the ‘social’ aspect of the European model given way to sheer financial imperatives? At the annual Society for Advancement of Socio-Economics (SASE) conference earlier this summer, in our session myself, Jason Heyes and other delegates were urged to consider a more benign interpretation of the European Semester – the EU’s annual appraisal ‘cycle’ which monitors and advises on European social policies through a range of mediums. Based on a recent paper from the Swedish Institute for European Policy Studies (SIEPS), the suggestion was made that the policy priorities of the European Semester – as expressed through a range of Commission initiatives, including Annual Growth Surveys (AGS) and Country Specific Recommendations (CSRs) – have ‘reoriented themselves towards a more social balanced stance beginning in late 2011’. In addition to widespread advice on pensions, the SIEPS report also cites a series of socially driven recommendations to reduce poverty and improve the effectiveness of social protection systems, education, training and active labour market policies delivered across the EU. In short, the ‘social’ part of the model is said actually to be making a resurgence in the form of country recommendations which stem from the Semester. Importantly, though, appraisals and recommendations are seen to vary from state to state. Whether readers buy this more positive account of the European Semester, there is certainly ‘wiggle room’– even within crisis states – for autonomous reform based on self-identified needs and interests (with or without EU advice). I have made this point before with reference to states in Southern Europe, including Spain and Italy, and drawn attention in particular to the former’s ability to shield a pre-crisis benefit system in favour of more concentrated efforts to amend the dualist Spanish labour market. Equally distinctively, Italy has introduced reforms intended to enhance employment rates (e.g. via reduced social contributions for firms), whilst strengthening social protections for groups of (non-)workers who were previously not provided for through the Assicurazione Sociale Per l’Impiego (ASPI) and the ‘mini’ version. This latter scheme provides benefit payments for those with just 13 weeks’ worth of contributions in the prior 12 months, and may form the starting-point for a modern social security system covering an ever larger proportion of the unemployed. We should also always scrutinise carefully the origins of reforms which do take place, seemingly, under duress. In the case of Irish water privatisation – understood as a clear imperative of the troika – the Irish state has long maintained an ‘Exemption’ (via article 9.4 of the EU Water Framework Directive) absolving the government from any such requirements. It is fair to assume that the decision to ‘privatise anyway’ may have been one sought by the Irish government for its own practical and/or ideological reasons. It is still unclear in fact whether or not this argument for the exemption will have ramifications further down the line. In Portugal in 2014 the decision to cut public sector pay en masse was deemed in breach of the constitution, severely hampering the €800 million saving intended by the government. Finally, returning to the case of Greece, it remains to be seen how social policy reforms will unfold in practice, although the prolonged attacks on pensions and the minimum wage will make it difficult for anyone dissuaded by the logics of austerity to find much scope for optimism. My general point, though, is surely clear: we must focus on the uniqueness of every country’s crisis, the distinctiveness of the reforms being implemented and the varying possibilities (which always exist) to challenge reforms as and where necessary. Note: I would like to thank Professor Jonathan Zeitlin for chairing and providing feedback on my session at the 2015 SASE annual conference and Antonine Gilsenan for insights into water charges disputes in Ireland.